A simple formula for exactly how many hours should be spent prepping for the SAT would certainly make test prep easier. The truth is no two students are the same, therefore no two students will need exactly the same amount of time to prep for the SAT. There are a few ways to gauge how many hours of study you will need to prepare for the SAT. Take a timed practice test. Your results will help you gauge how many hours you need to spend prepping for the real exam. Develop your target score and see how much you need to improve your score. The bigger the discrepancy between your practice test score and your goal score, the more time you will need to focus on test prep. The amount of weeks you have given yourself to study before the SAT will also influence how many hours a day you need to study. If the test is months and months out you will only need to study a few hours a week. If the test is in two months or less and you have just started studying, you may need to put in a few hours a day. The Choice, A New York Times Blog, suggests registering for an exam that is at least eight weeks out to give yourself enough time to study without needing to cram. Taking a timed practice test again, after you have put in time studying, will help you decide how quickly you are improving. If you saw significant improvement, stick with your plan. If you are not improving, revise your strategy, plan for more hours and consider test prep help. There is no universal chart for the perfect amount of study time. You need to discover how comfortable you feel with the exam, how much you need to improve, and what skills need to see progress, then develop your own plan and stick with it. The important thing is to actually develop a plan and use it. Don’t put off studying until the last minute. The sooner you get started, the less time each week you will need to devote to test prep. Keep in mind that extra steps to enrich your learning such as reading above and beyond classroom material, or working on problem solving skills, may not be directly counted as hours towards test prep, but they will certainly improve your score. 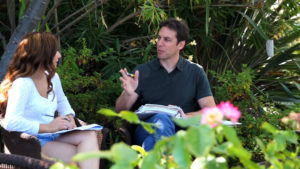 With over 18 years of experience, Mr. Test Prep operates the premier Palo Alto SAT test prep program. By combining one-on-one SAT tutoring with free SAT practice tests, Mr. Test Prep offers the benefits of private SAT tutoring (focused attention, tailored instruction, a human connection) in a group environment, which prepares the student for the SAT test experience. Students who attend his Palo Alto SAT Test Prep program will see their hard work and dedication reflected in significant score increases. Call Mr. Test Prep today and get prepared!